Whether you are an established business or start-up preparing to launch, we can help connect customers to you, and retain a long-term relationship with your customer base. Simply complete the form below to request a free consultation. 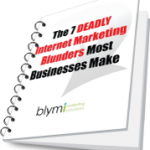 You’ll also immediately receive a copy of our detailed guide for business owners ‘The 7 Deadly Internet Marketing Mistakes‘. This guide will help facilitate our discussion, and gives you lots of help on identifying, and fixing, some critical Internet Marketing mistakes that may be affecting your business. What would you like your free consultation to focus on?